Well, it’s not really Moth or Brizzle related, but I’ve been keeping a bit of an eye on the ISAF trials for the womens skiff in Santander. There’s quite a selection of boats out there, including two of my E6 Cherubs disguised as Arup skiffs. I think it will be interesting to see the outcome, but rest assured the choice will probably not be down to the best actual boat, more whatever happens to fulfill some outrageous criteria someone has dreamt up! Such fun. I’d go for the mini 49er personally. Makes the most sense from a pre-installed supply point of view – means some people might actually be able to afford to give it a shot in the first place rather than ponying up for a new boat right off the bat. This week the town of Santander in Spain has played host to ISAF and the trials of six skiffs, one of which will be chosen as the boat for the Women’s Skiff event in the 2016 Olympics and possibly beyond. Two E6 UK-Cherubs designed by Kevin Ellway, built by Aardvark Technologies and beautifully liveried as Arup Skiffs have attended the event as one of the six entries. You may recognise these as the boats as “Eleanor” and “Marmite” displayed at the RYA Volvo Dinghy Show, Eleanor winning the 2011 Concours D’Elegance Award. Accompanying the boats are a team of UK-Cherub sailors headed by Roland Trim and he is supported by his employer, the engineering firm Arup. Photos and reports from the event show the boats performing fantastically well, and although there have been days of poor weather there has also been sufficient time for the Olympic sailors to trial the Arup Skiffs, which offers a much lighter alternative to the other five contenders. The ISAF are expected to make the decision on which Skiff will be used in the 2016 Olympics during May 2012. 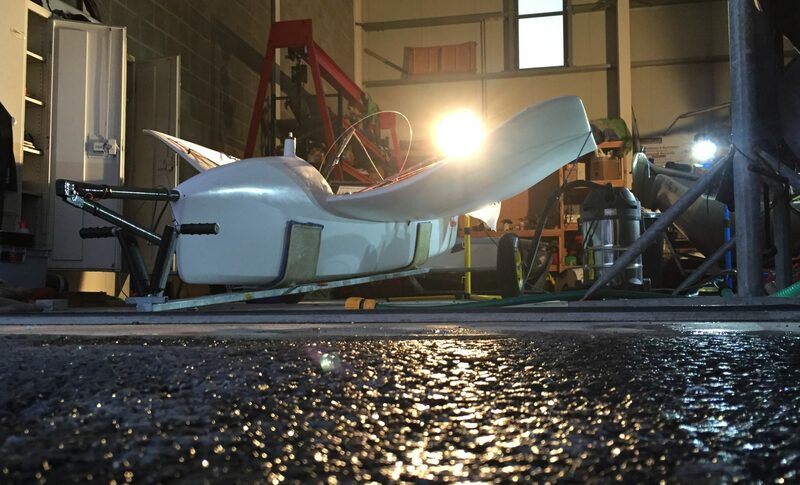 We wish everyone involved with the Arup Skiff Project the best of luck with the selection. The UK-Cherub class is proud to be associated with this project and to have lent its support, boats and expertise. You can read more on the Arup Skiff website, and read the Arup News here. We wish everyone a safe trip home. I was promising myself that I wasn’t going to be one of those people that let the blogging slip, but unfortunately the simple fact is that I haven’t been Moth sailing! I was thinking about boring you all with the 9 tons of topsoil Em and I had to move to level the back garden or the foundations for my shed so I can finally empty the workshop of my toy boats/junk – I just don’t think that would cut it on the Bristol Moth Blog. So whats been going on? Well, Alan and Leo have both been spotted out at the club, along with our new Bristol Mothie Ben who has just picked up a Hungry Tiger conversion to learn the ropes on. Darren had a ‘slight skiing incident’ which has precluded sailing while Martin got his eyes lazered a month or so ago and is only just at the ‘water safe’ stage. I’ve tried to get out to the club a couple of times but have been foiled (ha, love a good pun) by a lack of breeze. I was promising myself in the autumn last year that I’d sail all winter and stick to my fitness regime and be on top of my game when the season came around. That went out the window with the house move and while I’m probably fitter than I have been at the start of a season I’ve only sailed three times this year and already managed to miss the first open! I’d like to thank my partner in crime for the weekend James Phare for putting me up and jollying around Chinatown and trying to find the Lark party. Si Payne for lending his boat and spending most of the show on the stand with me and James. Others to thank are Jason Russell, Neil Baker, Jo Wellard, Adam May, Katherine Knight, Mike Lennon and anyone I’ve forgotten for lending their time. We actually had a good laugh on the stand and I really enjoyed it. Next up is Parkstone. I’m really hoping to have been sailing by then and will hopefully tell you all about it!